Recommendations and changes in GST made by the GST Council in its 22nd Meeting held on 6th October 2017 under Chairmanship of the Union Minister of Finance and Corporate Affairs, Shri Arun Jaitley in Delhi. It shall be made available to taxpayers having an annual aggregate turnover of up to Rs. 1 crore as compared to the current turnover threshold of Rs. 75 lacs. This threshold of turnover for special category States, except Jammu & Kashmir and Uttarakhand, shall be increased to Rs. 75 lacs from Rs. 50 lacs. The turnover threshold for Jammu & Kashmir and Uttarakhand shall be Rs. 1 crore. The facility of availing composition under the increased threshold shall be available to both migrated and new taxpayers up to 31.03.2018. The option once exercised shall become operational from the first day of the month immediately succeeding the month in which the option to avail the composition scheme is exercised. New entrants to this scheme shall have to file the return in FORM GSTR-4 only for that portion of the quarter from when the scheme becomes operational and shall file returns as a normal taxpayer for the preceding tax period. The increase in the turnover threshold will make it possible for the greater number of taxpayers to avail the benefit of easier compliance under the composition scheme and is expected to greatly benefit the MSME sector. Presently, anyone making inter-state taxable supplies, except inter-State job worker, is compulsorily required to register, irrespective of turnover. It has now been decided to exempt those service providers whose annual aggregate turnover is less than Rs. 20 lacs (Rs. 10 lacs in special category states except for J & K) from obtaining registration even if they are making inter-State taxable supplies of services. This measure is expected to significantly reduce the compliance cost of small service providers. turnover up to Rs. 1.5 crores, it has been decided that such taxpayers shall be required to file quarterly returns in FORM GSTR-1,2 & 3 and pay taxes only on a quarterly basis, starting from the Third Quarter of this Financial Year i.e. October-December, 2017. The registered buyers from such small taxpayers would be eligible to avail ITC on a monthly basis. The due dates for filing the quarterly returns for such taxpayers shall be announced in due course. 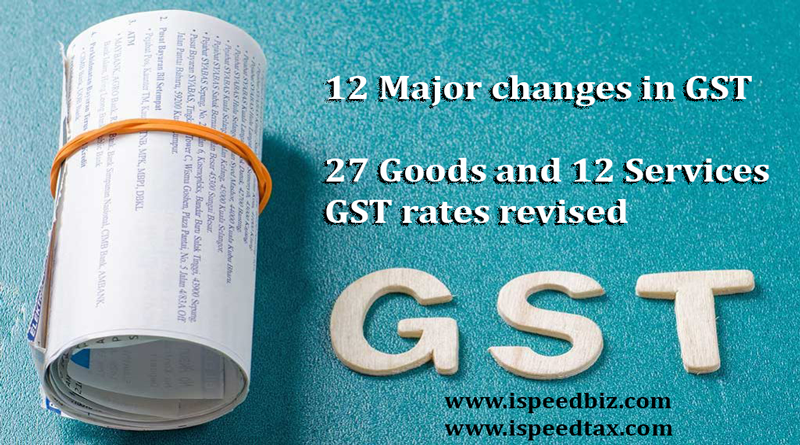 Meanwhile, all taxpayers will be required to file FORM GSTR-3B on a monthly basis until December 2017. All taxpayers are also required to file FORM GSTR-1, 2 & 3 for the months of July, August and September 2017. Due dates for filing the returns for the month of July 2017 have already been announced. The due dates for the months of August and September 2017 will be announced in due course. Registration and operationalization of TDS/TCS provisions shall be postponed till 31.03.2018. The last date for filing the return in FORM GSTR-4 by a taxpayer under composition scheme for the quarter July-September, 2017 shall be extended to 15.11.2017. Also, the last date for filing the return in FORM GSTR-6 by an input service distributor for the months of July, August, and September 2017 shall be extended to 15.11.2017. 15) All synthetic filament yarn, such as nylon, polyester, acrylic, etc. To issue a clarification with regard to classification of printing products/services.